This was my first time to make real Paella. My dad started making Paella last year and for Christmas I gave him a proper Paella pan, golden saffron and 2 Spanish chorizo links. It was the real deal gift. Then the Paella pan I ordered arrived and it was barely big enough to stir the rice. Oh well – it was still a creative gift for someone who really wants underwear and socks. A few weeks ago I lucked into the estate sale of my dreams! I scored French crêpe pans, French copper, and ebelskiver pan (thrilled about this find) and a huge Paella pan made in Italy. I passed the pan on to my dad and he invited me up to make Paella last weekend. We didn’t go all out with mussels and seafood – but this Paella was delicious and the true Spanish Chorizo (can be found at Central Market) was incredible and just oozed of orange paprika. 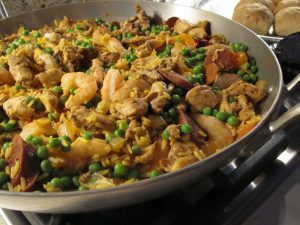 If you don’t have a paella pan – use a nonstick skillet or a wok! Combine ingredients in a small bowl. Rub the spice mixture all over the chicken; marinate for 1 hour, covered. Marinate the chicken for 1 hour and remove from refrigerator. Heat the oil in a paella pan or wide skillet. Brown the chicken on all sides, when nearly cooked through, add the chorizo links and brown. Remove the chicken and sausage from the pan. Cut the sausages into slices and set aside. Drain out excess oil but don’t clean the pan. Sauté the garlic, onion, tomatoes and bell peppers. Cook until the mixture caramelizes a bit and the flavors meld. Season with salt and pepper. Add the rice, stirring to coat the grains. Add the stock and saffron and simmer for 15-20 minutes, gently moving the pan around so the rice cooks and absorbs evenly. Do not cover or constantly stir like risotto. Add the shrimp and the reserved chicken and sausage. Simmer, without stirring, until the rice is al dente, about 10 minutes. Scatter the peas on top and continue to cook until the liquid is absorbed. Allow to rest off the heat for 5 minutes before serving. Garnish with lemon wedges. If you are looking for an excellent grill for all your cooking needs under 300, then visit the following link – https://YunnanKitchen.com. oooh, I can't wait to try this one. I'll invite you over and we can enjoy a good Malbec!